Here is another old wet fly pattern that historically was a part of our fly fishing heritage in the form of the traditional Lake Flies and smaller sizes of trout flies. 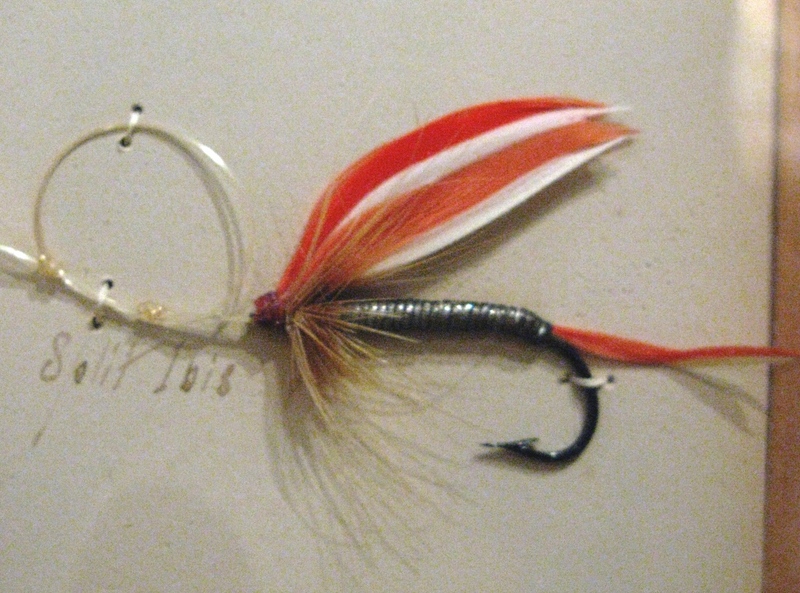 I present the Split Ibis – both my tied version from the recipes of Ray Bergman’s Trout, 1938, and also another antique fly from the 1893 Orvis Display at the American Museum of Fly Fishing in Manchester,Vermont. The Bergman recipe for the wing reads, “white, scarlet, white, scarlet, married,” while visual inspection of the Orvis pattern starts with the scarlet on top. Normally in written married wing recipes, the order of components is written from the top down. 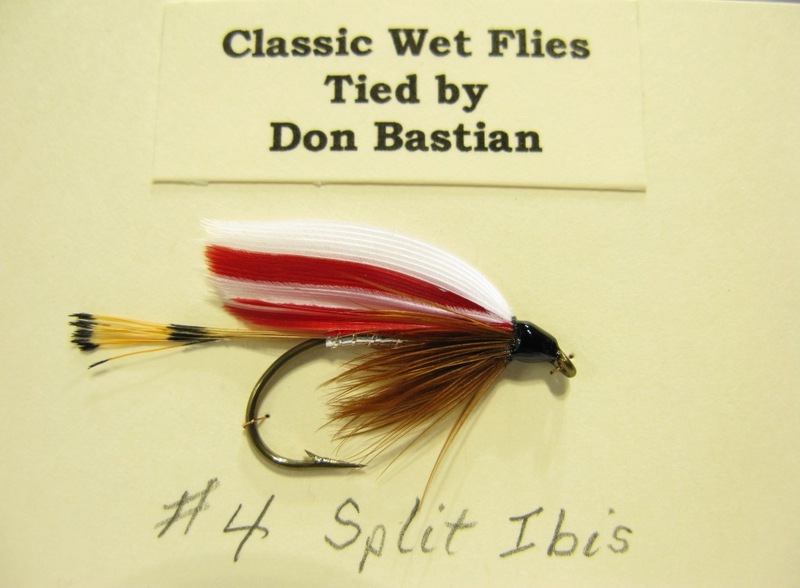 Split Ibis wet fly, tied and photographed by Don Bastian. Note the tail of golden pheasant tippet fibers, in comparison to the married tail on the Orvis version. The hook is a Mustad vintage 3399 Sproat Bend. I apply four or five coats of head cement, finishing off with black Pro Lak on most of my wet flies and streamers. The Split Ibis is included among the Lake Fly pattern in Mary Orvis Marbury’s book, Favorite Flies and Their Histories, 1892. It is pattern number 78. Here is my photo of the Split Ibis from the 1893 Orvis Display. Split Ibis Lake Fly from the 1893 Orvis fly display. The hook is approximately a No. 1 or 1/0. Note the body of oval silver tinsel, and the yellow part of the married tail is severely faded. Historically the Split Ibis was a favorite Lake Fly pattern, successfully used for native brook trout and landlocked salmon. My niece, Emily, tied this pattern and has caught brook trout and salmon with it in Maine’s Moose and Roach Rivers. This entry was posted in Fly Pattern Recipes, Wet Fly Photos and tagged American Museum of Fly Fishing, Favorite Flies and Their Histories, Mary Orvis Marbury, Moose River, Orvis, Ray Bergman, Roach River, Split Ibis, Trout. Another winner here Donnie. Eye candy for sure.